This sophisticated studio has everything you could need into 600 square feet while still feeling open and airy. It includes a fully-equipped kitchen with high-end cabinetry and German-designed fixtures, four-person dining table, heated bathroom floors, washer and dryer, private balcony, TV, internet and modern décor with warm wood accents. 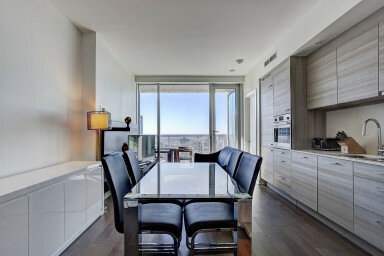 Floor-to-ceiling windows provide breathtaking views of Montreal and the St. Lawrence River, especially from the bedroom, where two full walls of floor-to0ceiling windows will make you feel like you’re floating above the city. A veritable eagle’s nest for the urban dweller! The Icône is an ultra-modern skyscraper complex gracing downtown Montreal with its cutting-edge architecture since 2016. The West Tower is home to 358 luxury condos, which could be your new home. The extensive communal amenities include a fully equipped gym, salt water pool, sauna, whirlpool, yoga room, lounge area, landscaped terrace, tennis court, 24/7 security and concierge—in short, everything you could need in one place. With a Walk Score of 100, this apartment literally could not be any more centrally located. It’s a short walk from the train station as well as several subway stations. Sainte-Catherine Street is just around the corner, where you’ll find every fashion brand , while more upscale boutiques line along De la Montagne Street, including luxury department store Holt Renfrew. Restaurants, cafés and pubs are a dime a dozen in this area, but for something truly different, we recommend raw vegan restaurant Crudessence. Also the Montreal Museum of Fine Arts, home to world-class special exhibitions and an encyclopaedic permanent collection has something for everyone. In the mood for nature more than culture? Luckily, as its name suggests, De la Montagne Street leads straight to the mountain, the ultimate spot for a morning run or Sunday stroll, or even for cross-country skiing on 22 km of groomed trails in the winter.